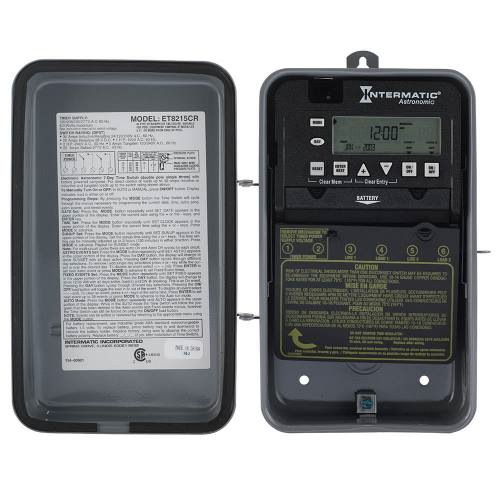 The Intermatic ET8215CR is an electronic astronomic 7 day time switch in a metal NEMA 3R enclosure for indoor or outdoor use. It can control one or two circuits simultaneously. 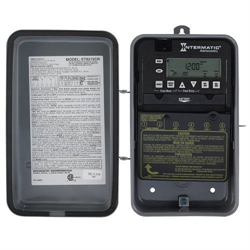 Astronomic function allows it to adjust sunrise/sunset times automatically throughout the year. Automatic DST adjustmen. Field replaceable AAA batteries last for at least 2 years. Supports 56 total events (14 ON & 14 OFF plus 14 Astro ON & 14 Astro OFF). These set points can be programmed for any or all 7 days to provide for up to 224 set points each week. MIN. “ON” or “OFF” TIME: 1 minute. MAX. “ON” or “OFF” TIME: 6 days 23 hours 59 minutes.